Third Rail launch August 28 at 7 pm! Third Rail Beer, a new craft brewery owned by a trio of native New Yorkers, is launching in its hometown this summer. Third Rail Beer is driven by a passion for innovation and the endless pursuit of quality, honoring beer heritage, and pride in the culture and community of New York City. Third Rail Beer will make its NYC debut with two beers: Bodega, an abundantly hopped American Pale Ale brewed with Citra and Centennial hops; and Field 2, the brewery’s take on a classic Belgian Farmhouse Ale. There will be giveaways and specials, and the brewery’s staff will be on hand! Painted Bride Quarterly Presents Slam, Bam, Thank You, Ma'am! September 15 at 7 pm. Fret not, New York. We’re coming back! 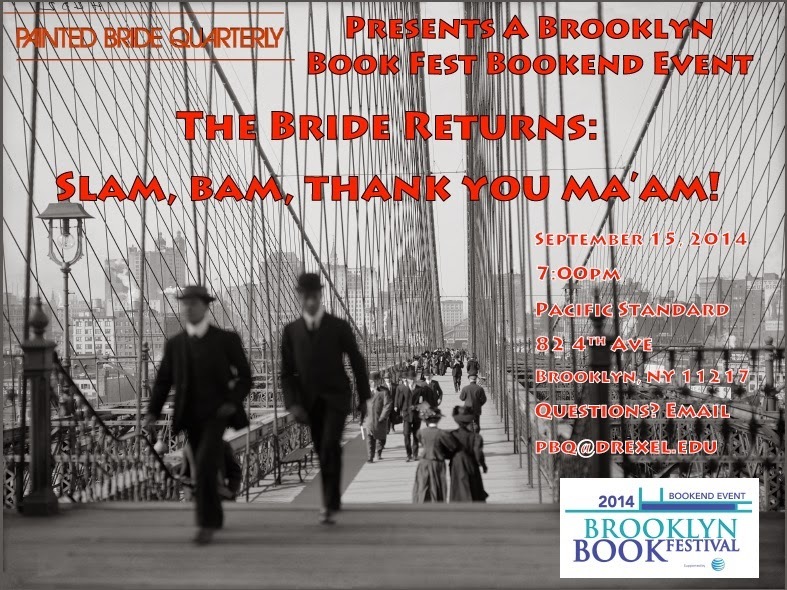 We’ll be hosting a special Bookend Event edition of Slam, Bam, Thank You Ma’am! at Pacific Standard on September 15th, 2013 at 7:00 pm. Who could forget the immense success that was our first Brooklyn Slam when guests were prompted to use octopi and puberty in their pieces? Get ready for another night of laughs and blue books. We’ll bring the pens, paper, and brotherly love if you bring the hospitality and those beautiful minds! You can find more info on the festival here: http://www.brooklynbookfestival.org/ and the Facebook event here: https://www.facebook.com/events/853334868011027/. Battle of the Books reading September 18 at 6:30 pm! Late Night Library's 2014 Annual Battle of the Books is a bracket-style competition that pits debut books against each other until one is deemed worthy of the Late Night Library Championship Belt! Featured books are read by published authors and book industry professionals who didn’t write the books themselves. This year's event will be hosted by Julia Fierro, author of Cutting Teeth. Flapperhouse reading August 26 at 7 pm.